Banners is your simple unlock and earn app with some differences from the usual apps in the category. It pays in cryptocurrency and ads aren't displayed on your lock screen rather after you unlock your device. This not the first of its kind that I'm reviewing here at Infosmush. Earlier I reviewed Slidejoy that also paid you for viewing ads and sponsored content on your lock screen. You can read the complete review here. This is an android app which you can download from Play store or directly from their website. The app will display sponsored content and ads after you unlock your phone and you will earn for every ad viewed. You don't have to click the ad. After you have completed the sign-up process which involves a short survey that helps them show relevant ads. You will need to turn on the app and give 'draw over other apps' permission. Now the app will show ads once you unlock your phone. You can also choose the rate at which the ads are displayed (in relation to the number of unlocks). i.e. 8 ads per 10 unlock, 6 ads per 10 unlock and so on. Or you can set this to Always. Ads will be displayed every time you unlock. What you will earn is FND(Futurenet Dollar) which is the internal currency of Futurenet(parent company of Banners app) and Banners app. Your earnings will be credited to your account at the end of every week. To get your referral bonus, users need to enter your referral code when they sign up or download the app through your referral link. 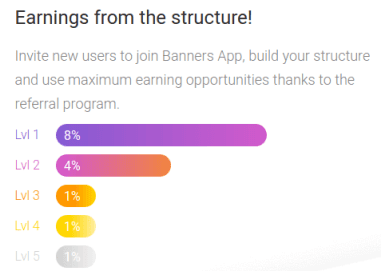 For example, when you enter this Banners app referral code: infosmush I will earn 8% of your earnings. You can withdraw your earnings to any FuturoCoin wallet. FuturoCoin is a cryptocurrency like Bitcoin. There aren't any reviews on trustworthy sources to conclude whether it is legit or not. And for some reason ads won't show up on my mobile. So I haven't been able to determine whether the app is legit. But I did email them about the issue on my device. Hope they resolve it soon. Banners app is relatively new as there is no sure way to know they pay or not. So you should stick to the app that is legit- Slidejoy. I'll update the review once I find new information.